ST. GEORGE — A storm is bringing yet more potential for flash flooding in Southern Utah Sunday. Bookmark this page for continuous updates about storms and flash flood conditions in Southern Utah Sunday. Update 4:37 p.m. Flash flood warning cancelled for Hildale-Colorado City area. Update 4:05 p.m. Flash flood warning issued for Hildale-Colorado City area. 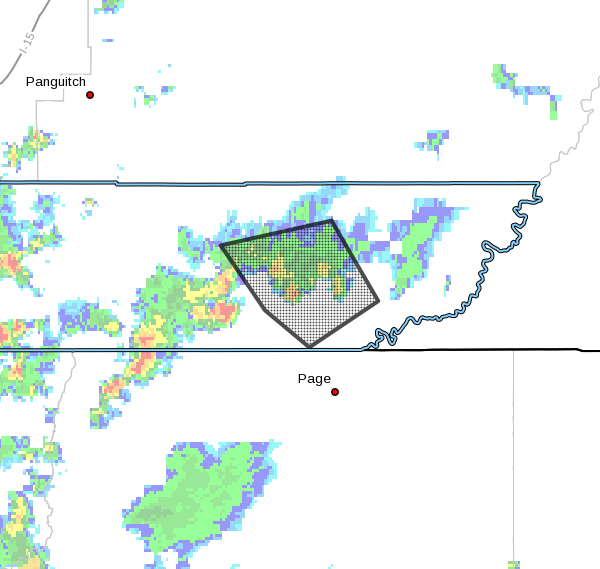 At 4 p.m. MDT / 3 p.m. MST, Doppler radar indicated a thunderstorm with heavy rainfall has impacted Hildale and Colorado City. The National Weather Service initially issued a flash flood warning for the area, but it has since been canceled after the storm passed. Just after 2 p.m., Doppler radar indicated an area of thunderstorms producing heavy rain over south-central Kane County, including Deer Spring Wash and Kitchen Wash. Flash flooding is expected to begin shortly through Buckskin Gulch and House Rock Road. A flash flood warning issued by the National Weather Service is in effect for the area until 5 p.m.
At 2:23 p.m., Doppler radar indicated an area of thunderstorms producing heavy rain over Wahweap Creek, Warm Creek and Last Chance Creek in central Kane County. Flash flooding is expected to begin shortly in Big Water, Wahweap Creek, Warm Creek and Last Chance Creek through their terminus at Lake Powell. The National Weather Service has issued a flash flood warning for the affected areas in effect until 6:30 p.m.